If you are a system admin or application and web application developer with a basic knowledge of programming and want to get hands-on with tools such as Jenkins 2 and Chef, and Cloud platforms such as AWS and Microsoft Azure, Docker, New Relic, Nagios, and their modules to host, deploy, monitor, and manage their web applications, then this book is for you. The DevOps culture is growing at a massive rate, as many organizations are adopting it. However, implementing it for web applications is one of the biggest challenges experienced by many developers and admins, which this book will help you overcome using various tools, such as Chef, Docker, and Jenkins. On the basis of the functionality of these tools, the book is divided into three parts. The first part shows you how to use Jenkins 2.0 for Continuous Integration of a sample JEE application. The second part explains the Chef configuration management tool, and provides an overview of Docker containers, resource provisioning in cloud environments using Chef, and Configuration Management in a cloud environment. The third part explores Continuous Delivery and Continuous Deployment in AWS, Microsoft Azure, and Docker, all using Jenkins 2.0. 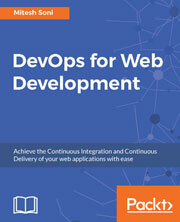 This book combines the skills of both web application deployment and system configuration as each chapter contains one or more practical hands-on projects. You will be exposed to real-world project scenarios that are progressively presented from easy to complex solutions. We will teach you concepts such as hosting web applications, configuring a runtime environment, monitoring and hosting on various cloud platforms, and managing them. This book will show you how to essentially host and manage web applications along with Continuous Integration, Cloud Computing, Configuration Management, Continuous Monitoring, Continuous Delivery, and Deployment. This is a learning guide for those who have a basic knowledge of application deployment, configuration management tools, and Cloud computing, and are eager to leverage it to implement DevOps for web applications using end-to-end automation and orchestration.